For business owners, asset protection may be the firewall that could protect the business and wealth they have created over years from unforeseen circumstances and loss. Small businesses, in particular, may lack sufficient insurance coverage to prevent a catastrophic judgment in a lawsuit. Medical professionals may be at risk of a devastating malpractice claim. Medical professionals face risk because of their profession. For example, by the time they reach age 65, more than 98% of all surgeons and 90% of anesthesiologists are projected to face at least one medical malpractice claim. * Business owners face risk as well, including liability from employee activities, employment-related claims, and property or product-related risks. Clients who fit these profiles may be interested in exploring captive insurance for asset protection. But affordability poses a challenge. For clients looking to subsidize coverage or manage the cost of insurance, captive insurance may be the answer. Captive insurance means essentially, that business owners can create an insurance company to fulfill a business’ needs. 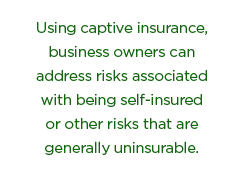 Using captive insurance, business owners can address the risks associated with being self-insured and other risks that are generally uninsurable through ordinary insurance markets, or they can supplement existing coverage. 2. Potential cost savings over time. Captive insurance may address the rising cost of insurance. Instead of paying the insurance company costs plus a profit margin through premium payments, the captive insurer retrains these funds. Effective risk management can also help to minimize or avoid claims. Direct ownership of the insurance company provides a powerful incentive to avoid claims. For example, consider a private medical practice faced with soaring costs of malpractice insurance premiums. The doctors in the group may see value in reducing the cost of their coverage by increasing deductibles or lowering coverage limits. The savings associated with those actions could be used to offset the cost of funding a captive insurance company. The doctors may choose to gradually increase the deductible to add to the captive insurance. The risk and cost may be transferred from the outside malpractice insurance provider to the captive insurance company in this process. 4. Risk management. Captive insurance may help address and manage certain risks where commercial insurance coverage is not readily available or reasonable from a cost perspective. 5. Wealth accumulation, cash flow, and wealth transfer. Funds inside the captive insurance program accumulate over time and can be a financial asset to the practice or business, subject to claims history. To the extent that claims losses are historically low, the funds could continue to grow. Depending on the growth of reserves versus claims history, the captive insurance may be able to provide cash flow to the owners via dividend payments. Through effective estate planning, ownership of a captive insurance company can also be transitioned to heirs through the use of trusts or Family Limited Partnerships (FLPs) or trusts. * New England Journal of Medicine, August 2011.